Asciano is a small medieval village about 26 km southeast of Siena, in one of the most beautiful and sprawling areas of Tuscany, the Crete Senesi. The mostly treeless hills of clay have been shaped by wind and water into an almost surreal erosion landscape. Asciano, still surrounded by the ramparts of the 14th century, is an ideal starting point for exploring the beautiful Tuscan countryside and the numerous monuments. Siena 25 km, Montalcino 30 km, Pienza 35 km. Montepulciano 45 km. 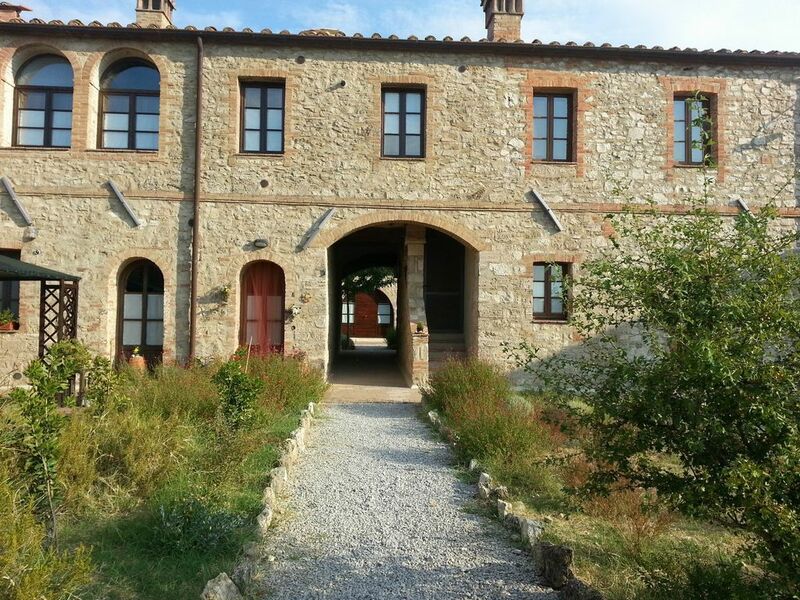 The hamlet "Borgo" is located in a quiet location on a small hill, just 2 km from Asciano. This holiday complex was renovated in 2003 and converted into comfortable holiday apartments. The guests have a large panoramic garden with lawn and a beautiful swimming pool and a tennis court (artificial turf) available. Driveway over the long picturesque cypress avenue. The apartments are all very spacious, elaborately restored and tastefully decorated. Tuscan-style furnishings with terracotta floors or wood-beamed ceilings. Deposit € 150. Gas, water, electricity included. Final cleaning included. Not included and to be paid on the spot: bed linen and towels € 8 per person. Baby bed 50 € / week, tourist tax 1 € per person, max. 3 days (free to 12th century), heating 12 € / day. Internet Wi-Fi, free, on request until the availability of the router.